Have you heard the news? 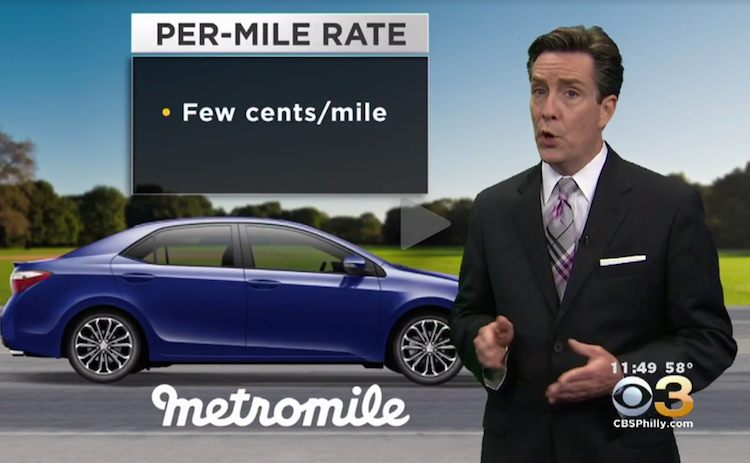 There’s been a lot of TV coverage lately about how much money Metromile’s pay-per-mile car insurance offering is saving low-mileage drivers, and we wanted to share the highlights with the whole Metromile community. Below is a segment that aired on CBS Philadelphia, featuring our fearless leader (aka CEO), Dan Preston, and a happy customer who is saving $90 per month on car insurance after switching to Metromile. The customer, Adam VanCuren, was paying a hefty car insurance bill when he wasn’t even driving much. Since he works from home, his car usually just sits outside his house. Now that Metromile’s per-mile insurance offering is available in Pennsylvania (among other states), Adam could save $1,000 this year since his monthly bill is based on the miles he drives (or doesn’t drive). A similar segment also aired in Chicago, Pittsburgh and San Francisco, and we expect that the per-mile insurance revolution will continue to gain momentum as its affordability (and fairness) is proven. Are you a happy Metromiler and want a chance to bask in the spotlight yourself? Drop us a line at stories@metromile.com so we can contact you if we have the opportunity to share customer stories!